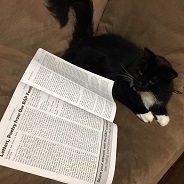 As a first time writer to our newsletter, allow me the honor of introducing myself to all you beautifully talented readers, both inside the system and out in soci­ety. I’d like to send prayers out to everyone affected by the past few hurricanes. To my family in Mexi­co hurt by the devastation, los qui­ero much y espero que esten bien todos. To the many suffering in the states, united we stand and together we’ll rise. To my brothers and sisters incarcerated, God is with us always and with him by our side, everything is possible. Never give up, no matter the circumstances. I’d like to give a shout out to the family at B&P who does a phe­nomenal job at keeping us all connected. To all my gorgeous trans women and handsome bi guys, stand up with pride! Don’t be shy or afraid to be your true self. Tyven AKA Thai out of TX, Dominique “Nicki” E. I see you nena! and the proud beauty from NM, Shanelle. L AKA Mz. Bubblez! Amy G. from H-town, can’t wait to meet you chula! Anyone wanting to correspond can find me on the pen pal list Los quiero a todos ustedes, mi gente hermosa! Hello All Brothers and Sisters of Black and Pink! One thing I’ve always hated is the feeling of being exposed, vulnerable, and being watched while I shower. (I’m transgender in a male prison in SCI-Fayette, PA.) . Even a towel is offensive to these CO’s senses because they remove them wen your back is turned, or write you up, or at worst they mace you for it without warning. Quite frankly, the only thing I’ve been able to do is utilize the grievance forms and PREA reports. It hasn’t yet proven effective because my body isn’t “Feminine Enough” for them. So I continue. I take all of what is written in Black & Pink’s letters from the heart and nourish my lonely heart. This keeps me fighting for simple things like Privacy, Medical Treatment, and Respect for (in some cases) just being Alive. All of you who’ve found love Stand tall all you LGBTQIA members and Allies, incarcerated know you are blessed, or, I should say, you bless others with your love. Keep shining bright with Love and Peace so you push back the darkness of Hate and War. Every battle I’ve faced here in Prison has only strengthened my resolve to win for not just myself, but for all other sin similar straights. Each battle counts whether in deeds, words, or Laws… No matter the size it counts. the day is coming where we will be treated as HUMAN; not just the derogatory “Labels” they slander us with. If we all stand together they can’t knock us down. Sorry, for all the different paragraphs. My mind has no linear thought really. I’ve got some mental illness issues. Either way, I fight thanks to the Love and Support everyone at Black & Pink and all those who write in or just pray for us, thank you. I’ve been in a few serious relationships in the last four years and I believe I’ve found the Love of my life. As exciting as this sounds I’m scared to acknowledge any of these as reality. I’m now 22 with only 18 months left and the person I’m so in love with is serving a decade. After I get out! They are the person I’ve been searching for. Fam! If you’ve found that one. If you’ve seen the stars and moon. If your heart sits in anothers hands, don’t give it up. Love is what keeps this world turning. Love is always the answer. Every great religion teaches us that love is the key to a happy life. Thank you so much Black and Pink! You’ve brought me so much help and understanding. I hope to contribute even more in the future. I even hope to see this in the next newsletter. We are all one people. We all matter. A saying we’ve been using here in Arizona: Orange live matter! Just because we’re behind bars does not mean we are not human. Thank you! All of you beautiful people who give your time and money for us. All of you are amazing people. The same goes out to every single Family member out there. We are all one. We are all incredible people destined for greatness. With all my heart, I love you! If I may, I want to just speak from my heart. My name is Mikala V. I am a 23 year-old black female. I am and have always been openly bisexual. I’m currently serving a 20 year sentence (still have 2 years left) for bank robbery. I want to say how much I appreciate Black & Pink News. I’ve just recently started reading the magazine and I’ve never felt so empowered. 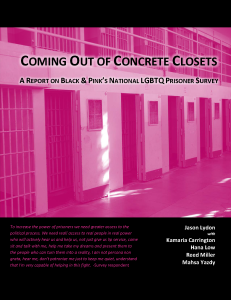 I read the letters from other and I’m actually shocked by the lack of support within the LGBTQ community within the prison. Here in the Arkansas Department of Corrections, the LGBTQ community not only embraces one another, but support and help one another. I love and embrace who I am. I OWN it!! I’ve just recently cut all of my hair off. I’m not a stud by any means, I’m just a bald-headed woman (lol). The love and support that I receive on a daily basis makes it a lot easier to be who I am and I enjoy the fact that other young members of the LGBTQ community are inspired to also be their true selves. 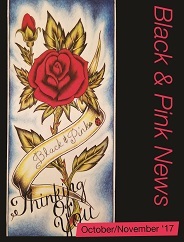 I am totally looking forward to the next issue of Black & Pink News. I’m totally open to writing pen pals. Although I’m new to the B&P Family, I thank you from the bottom of my heart for making me feel so welcome and accepted.